#edchatie Friends: Save the date for #GREAT15 Exciting News: #CEP811 Wins Best Online Course for 2015! 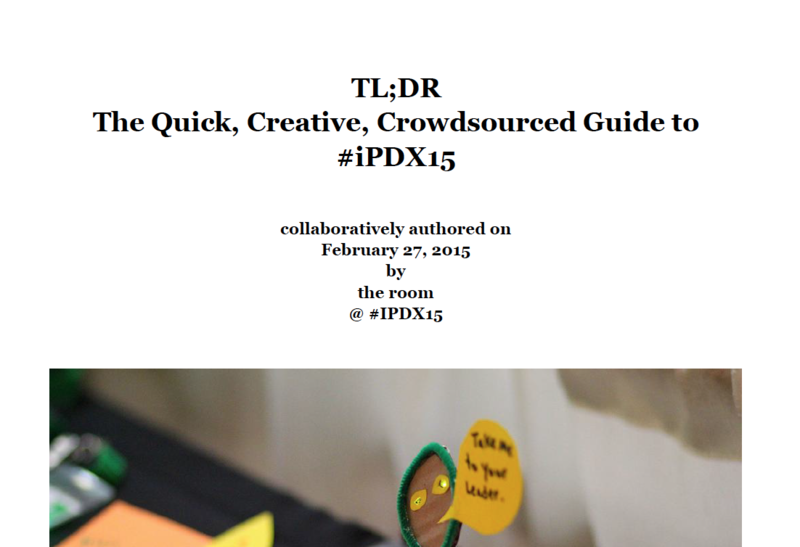 This afternoon about 500 participants at the #iPDX15 conference collectively authored a book, in about 20 minutes. Here’s a quick behind the scenes peek into what we did, and, how you can do it too! Almost a year ago Darren Hudgins emailed me and challenged me to create an interactive keynote for about 500 people at the IPDX15 conference. A year or so of thinking culminated in a fun activity that took place this afternoon. I have been running Quickfire Challenges for a while now, but, I’ve never done anything to this scale. At the core of a Quickfire challenge is a deep (hopefully) transformational learning experience in a short time period. Here’s how this challenge played out. I wanted participants active at their tables curating the information that had been shared over the 3 days of the conference. I wanted the activity to have a meaningful & tangible outcome. I decided that the outcome of this activity would be a collaboratively authored book and I worked backwards from there. I created 50 open google documents (with custom bit.ly links) with about 45 different writing prompts. Each table was given an envelope with the bit.ly custom URL. When the timer (20 minutes) started the participants accessed their google documents and began on their prompt/challenge. The prompts ranged from writing poetry, to creating images to sharing a “just one thing” take away for specific disciplines. Then, I talked a bit about bricolage, Sherry Turkle’s Evocative Objects and then added one more twist … I let everyone know that there is an Espresso Book Machine at Powell’s Bookstore and they could take these raw materials and print a book! I gave them an extra 10 minutes to go back to their document to edit/clean up the text for printing. If anyone is interested in printing the book, there is one more level of formatting that needs to be done to prepare the text for the Espresso Book Machine. Formatting directions are here (https://www.powells.com/bookmachine/) or (for a fee) Powells can help with the formatting as well. One of the key things I wanted people to take away from this was that there was an intentional and tangible purpose to our activity. It was really important for me in creating this activity for our group to collectively create something that could be useful to others. I believe this idea could be repurposed in many ways. Say you’re working on curriculum alignment – you could have a large group of people with carefully constructed tasks, give them a short amount of time, then SURPRISE – you’re half-way to aligning your curriculum to standards. As a classroom teacher you could do a derivative of this activity in almost any discipline. I would sincerely like to thank everyone for playing along! This was a tremendous challenge to me and I hope you enjoyed the experience. If you take this idea and run with it, please keep in touch and let me know how it plays out! !